Those who are interested in acquiring a variety of precious metals coins might want to consider foreign coins, too, as they are often more rare and have higher purity. Chinese gold and silver Panda coins have many devoted followers since their introduction in the 1980s. Not only are they appealing to investors due to their purity and low mintages, they are also popular among collectors for their yearly changing designs. Chinese coins have a long and rich history. Ancient Chinese coins are some of the earliest known coins in the world. The first coinage used in pre-imperial China (770-220 BC) came in form of tortoise shells, cowrie shells, gold, knives, spades, as well as coins. The first round coins began circulating during the Zhou period (starting around 350 BC) when both spade and knife money was the common. These coins had either a round or a square hole. After the first Chinese Emperor united China in 221 BC, round coins with a square hole became the dominant form of monetary exchange. Paper money started to circulate in the 9th century, but didn’t become widespread until the introduction of the yuan in the late 19th century. After the Communist Party of China took control of most of China, its People’s Bank of China introduced the renminbi (“People’s Currency”) in 1949. While the renminbi has been the official currency of the People’s Republic of China ever since, it is not legal tender in Hong Kong and Macau. These special administrative regions use the Hong Kong dollar and the Macanese pataca, respectively. Panda Coins are issued by CGCI or China Gold Coin Incorporation, which was established in 1987 and supervised by the People’s Bank of China. CGCI is tasked with the issuance of Chinese bullion and commemorative coins and the assessment of national reserves of precious metals. CGCI is responsible for coin development, design, mintage and distribution. 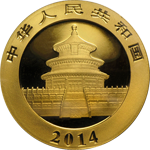 As any bullion coin, Chinese Panda coins are bought and sold based on the current spot price of gold or silver, in addition to a premium covering minting, handling, distributing and marketing costs. Chinese Panda coins typically have a higher premium than other bullion coins due to their low mintage numbers and yearly changing designs. However, CGCI has been increasing their mintage figures since 2011. In general, it is advisable to purchase a gold or silver Panda coin in its current year, as they are likely closest to the gold or silver spot price. Since forgeries have been appearing in recent years, make sure to purchase Chinese Panda coins from authorized coin dealers only. Chinese Panda coins are a great choice to diversify your portfolio and protect yourself from inflation, economical turmoil. As mentioned above, Panda coins normally have a higher market price than comparable bullion coins. Their low mintages put these precious metal coins in high demand, both in China and in the rest of the world. Since their design is changing every year, Panda coins are coveted by both investors and collectors. Panda coins are legal tender in China, have a 99.99% purity, and comes in a variety of sizes. Lastly, the Chinese Panda is among the most popular bullion coins worldwide, which also include the American Eagle, Canadian Maple Leaf, Australian Koala, and Austrian Philharmonic. The Gold Panda is a great coin for collectors and investors alike, as it is affordably priced and may increase in value tremendously over the next years and decades. The Silver Panda Coin is a fantastic option for coin collectors and precious metal investors alike as its price is relatively modest, despite the coin’s rarity.